Momoclo carried out the Zepp tour last year. Then, it performed 3 times in the 1st day. It is time when it was interviewed whether they succeed in this live. Other members were uneasy, but Reni speaks as follows. "I think that we can do it. Momoclo must carry out three public performances on the 1st. Because, I want the fans to be able to brag about this thing." Zepp tour live was held in Tokyo. Yama-chan is telling the situation at that time as follows. "I looked at Momoclo which lies by a stage sleeve on that day. The masseur said in this way while crying. However, they also said while crying. They walked up to the stage while supporting the body along the wall by hand. omg, that's both scary and awesome at the same time ..
From the episode of Shabekuri 7, I think they also did 3 show a day at Momokuri 2011 SSA. Do you have a source? It's not in the Jishin article. Afterwards she blogged that she was never sure why they were testing their limits this way, but now it's clear. It gave her a lot of self-confidence. No, just one. What made you think that? I watched that subbed video, at 6:18, they did 3 show and 64 songs in a day. Unless the translation is wrong idk .. I don't have this source(DVD). This episode seems to have been recorded to DVD. I watched plural reviews that the person who purchased this DVD wrote. They missed him saying mata/also over the oohing about Momokuri. The sentences refer to different events. Anybody know all the references in Osaretai? Or at least what "NG" stands for? Meaning of NG to say here is "can not". There is not "can not" about me. For example, it undertakes any work when they receive work from a client. "There is nothing that can not be her"
A company does not choose the work carefully. Therefore Reni is not worried about. Momoka and Reni sing the dissatisfaction of the company. Who is the most clever? Reni:Do not overdo it very much. Kanako:Wait a minute.I don't want you to say. A-rin:Yes. She teaches me it. Reni:Do you ask me it? Reni:I was said to a teacher. "Takagi doesn't need to do study"
Reni:My teacher said. "I'm happy enough simply because you're in there." Momoka:Does such a school exist? Does anybody know what Reni was doing before she joined Momoclo? Was she in the entertainment business like Momoka and Ahrin? I've seen video of the other girls in their pre-Momoclo years, but not very much of Kanako and nothing at all of Reni. Considering her face I guess she was picked off the street like Akari and only did camera tests until the agency found a use for her. Is it just me or does anyone else think that Reni looks absolutely amazing with the longer, to the side bangs instead of her usual normal bangs? Like when shes wearing the "Devil" outfit for Saraba, i think she looks so much more mature and pretty with her bangs to the side! She says in this way in last UST. "I think that a photograph of the costume of the devil is the prettiest in the photograph of the conventional CD jacket." 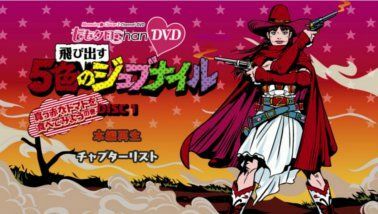 Watched Momoclo's 2012 appearance on Shabekuri007 again today, and just noticed that Reni's costume is covered with CDs. I bet she did that herself.